Powers: He doesn't tire and doesn't grow weary and once he touches anybody, he can always find him/her. He absorbs life-forces on touch. Needs to feed on life-forces regularly, and on totemistic (purer) sources occasionaly. His race fed on mutants. He doesn't digest radiation too well. He was stronger than Thor and the Hulk, so his strength may go well into Class 100. Another explanation, more plausible, is that whenever Spider-Man hit him he absorbed his life-force, and whenever he hit he did the same, increasing the impact. This would drop him to Class 75/80 levels. (Amazing Spider-Man II#32 (fb) - BTS) - Not much is known about Morlun. All of that is explained by Ezekiel: "Since the dawn of time, totemistic powers walked the Earth. These powers are the bridges between two different humans and other species. Since then, humanity re-tells history (shamans, priests, etc), fitting it in it's own limited views, "to get a momentary taste of totemistic force. Some do it for ritual", others to better understand the world around them, and others still "to project a sense of power". The ones Peter's been fighting for all his life. Every type attracts it's similar ("gods against gods, patriots against people who think they're patriots, mutants against mutants"): Vultures, Lizards, Scorpions, Cobras, Jackals, Rhinos, Octopi, and many others. They fight to attain the power of a specific totem, "guided by urges beyond their control and understanding", without even realizing what they're doing. They're just pretenders. And Peter is the "real deal". (Spider-Man: The Darkest Hours) - At some points in the past Morlun was mistaken for Wendigo and Grendl. (Amazing Spider-Man II#30) - The cargo ship where Morlun traveled to New York arrived at the docks. Morlun absorbed the life energies of German super-hero Bundesadler, his last supply for the trip. He prepared to go hunting for Spider-Man. His wrinkled skin, and white hair rejuvenated from having replenished his energies. (Amazing Spider-Man II#32) - The next day, as Peter was having a talk with Ezekiel about Morlun, and his (Peter's) powers (the one described in the first two paragraphs), Morlun was trying on new clothes with Dex. Later in that day, Peter left home after hearing a bulletin that reports trouble on the East Side. He arrived at the scene, a burning building. He rescued a woman, and then received the hardest punch he'd ever experienced (in his own words) and flew against a car. As he looked up, he saw Morlun standing before him. (Amazing Spider-Man II#33) - Spidey attacked, but Morlun was unnafected. Morlun only said he didn't want to kill Spidey, but he had to. He wouldn't tire, grow weary, and now that he had found him, he could always find him again. Then he shut up and proceeded in beating Spidey up. He bested every tactic Spidey used, employing innocent civilians to prevent Spidey from fleeing, and gave him a major beating. Peter (who's a mess by now) tried to flee anyway, and dresseed in civilian clothes hoping to go unnoticed. However, Morlun wasn't bluffing, and caught up to Peter and atacked him again. They fought their way into a kitchen, where Morlun lit a match, causing an explosion. Morlun's clothes were destroyed, and he left to find new ones. Spidey used the break to get to Ezekiel. He asked for help, but Ezekiel told him that he was doomed, and there was nothing anyone could do about it. (Amazing Spider-Man II#34) - Ezekiel said now that Morlun touched Peter, he could always find him, and that he didn't want to expose himself, because so far Morlun didn't know of his existence. He's not a pure source, but he's a "pretty decent appetizer". Peter left disappointed, and saw a columns of smoke: Morlun was luring him again. They went at it again, Spidey got a few breaks to phone his loved ones, but Morlun was relentless. But Ezekiel entered the fray, saying he changed his mind. In a double bow, Ezekiel landed a jab in Morlun's nose which shed some blood. Eventually, Morlun gots a hold of Ezekiel and absorbed his essence, letting him fall into the river (the fight had gone throughout the whole Big Apple - they were now at the docks). Morlun was satisfied, and left for the moment. Peter dove several times for Ezekiel, but he couldn't find him. He then remembered the shedded blood. He took the sample and went home to analyze it. He discovered that the blood was a mix of every form of DNA (human, insect, animal, bird, etc), in the purest forms he had ever seen. Probably "the cells break down" with time, and "he needs to recharge with a life source in each category". But Peter knew something Morlun didn't. He wasn't not pure… He invaded a Nuclear Power Plant and activated the alert. The workers evacuated, leaving him alone in there. (Amazing Spider-Man II#35) - Minutes passed, and Morlun arrived. He killed a cop who didn't let him come in, and Dex took his gun without him knowing. Spidey injected himself with radioactive fluid and collapsed. Morlun entered the room, and picked him up. He said the energy he would absorb from the "pure spider" within Peter would allow him to live for at least 100 years more. He tried to absorb Peter's energy, but he was burned instead. He couldn't understand, and Peter got up and explained: whatever the origin of his powers were, the radiation was a part of them. And while Morlun could feed on the Spider, he couldn't on the radiation. Spidey beat Morlun up. Whenever he touched him, Morlun became weaker because he absorbed the radiation. It was logical to assume that in their previous fight, whenever Spidey hit him, Morlun absorbed some energy, thus "never tiring", resisting every blow, and leaving Spidey a lot more vulnerable. Morlun was backed against some debris, and he begged Spidey to spare him, saying he would go away and never return. His skin looked like that of a snake or lizard. Peter questioned himself: should he leave Morlun alive to kill, or should he kill him? The decision was taken out of his hands when Dex shot Morlun. Spidey's hesitation was enough to give Dex the time to do it. Morlun died claiming it was nothing personal, he was just hungry, leaving a pile of ashes. Spidey let Dex go, because Dex told him that "He hurt me a lot". Probably he was let go not only by that, but because in his heart, Spidey knew that had he not hesitated, Dex wouldn't have had the time to shoot. So, he was as much to blame as Dex. He didn't know if he would have come to kill Morlun himself, but he suspected he would. (Spider-Man: The Darkest Hours - BTS) - The Ancients (Morlun's species) hired the Black Cat to find Morlun. The Ancient Mortia hired the Foreigner. The Black Cat brought Dex in for interrogation on his activities with Morlun. (MK Spider-Man#19 (fb) - BTS) - Morlun returned from the dead under unrevealed circumstances to kill Spider-Man. (Friendly Neighborhood Spider-Man#1) - Peter was haunted by Morlun in a weird nightmare. Morlun stood on a skyscraper not far away from Stark Tower and watched Peter Parker through his window. Peter just got bad news from a doctor and Morlun knew that it was time for Peter to die. (MK Spider-Man#19) - Morlun spied on MJ at the theater she worked. He followed her around backstage and watched her play. After the play he watched her leave the theater through her fans. A fan attacked another one because he insulted MJ. Morlun told this fan (or lets call him a stalker) where MJ went and went the same way. MJ left the bar after a fight with the stalker and Morlun stopped a cab for her by stepping in its way. She thanked him and called him a lifesaver, which was a first for Morlun. (Amazing Spider-Man I#525) - Spider-Man dropped into a dark alley and seemingly hallucinated (or maybe not) that Morlun was there talking to him. Morlun told him that he could kill him that second, but he was too interested in Spider-Man's deterioration. After that he jumped over a wall followed by Spider-Man, but when Spidey reached the other side he only met Wolverine, who told Spidey that they were alone. (Friendly Neighborhood Spider-Man#2) - Morlun followed Spider-Man to Wakanda, where the hero visited with Black Panther a temple of Anansi. Morlun watched him leave the temple without even entering it. Back in New York Spider-Man fought Ox, who suddenly transformed into Morlun. Spider-Man beat him up until Daredevil stopped him because it was just a hallucination and Spider-Man had nearly beaten Ox to death. (MK Spider-Man#20) - Morlun decided that it was time for Spider-Man to die, but he couldn't find him in the Daily Bugle or at home in the Stark Tower. He wondered were Spider-Man could be (he was in space with MJ in one of Stark's space-pods). (Amazing Spider-Man I#526) - Morlun finally found Spider-Man and attacked him. Spider-Man instinctively tried to flee, but Morlun didn't let him. Their fight went from the Daily Bugle the lab where Spider-Man gained his powers and back to the street. Morlun went through walls and none of Spider-Man's attacks seemed to do any damage. Spider-Man was beaten to a bloody pulp by Morlun, but he wasn't ready to die yet and fought back. Morlun was on the ground and Spider-Man didn't stop beating on him, but it still didn't show any effect and Morlun just ripped Spider-Man's right eye out of its socket and ate it. After that he continued to beat on Spider-Man. (Friendly Neighborhood Spider-Man#3) - Morlun watched Spider-Man's battered body when the police arrived. They planned to arrest him, but Morlun just killed two cops and jumped onto the next building to escape over the roofs. Morlun arrived at the hospital Spider-Man was kept after his life had been saved. He killed the guard in front of his room and entered to end Spider-Man's life. In that moment MJ ran into the room and tried to stop Morlun, but just tossed her into the wall and broke her arm when she threatened him with a knife. Spider-Man awoke further mutated and jumped Morlun from behind. Spikes grew out of his arms and he nailed Morlun's arms to the floor and then he bit into Morlun's head. Energy flowed from Morlun's body and he crumbled to dust. Comments: Created by J. Michael Straczynski, John Romita Jr. and Scott Hanna. Morlun was one of many foes Spider-Man briefly fought while traveling through time in Amazing Spider-Man II#500. ...will he return? We know nothing about him, except he's been alive for centuries. Exactly how old is he? Who has he killed in the past? Could he be able to transcend death, reincarnate, or anything else? Not likely, but we never know. ...and will others like him come hunting for Spidey? Ezekiel said there were a few roaming this world. So that makes them "a few minus one". Will they come? Will Spidey use the same tactic? Will Spidey be forced to kill them? I don't know, but I just can't wait. In the novel Spider-Man: The Darkest Hours Morlun was revealed as a member of a race called the Ancients, who fed on mutants. Info on them included that they had hired the Black Cat to find Morlun. Revealed members were Mortia (who had hired the Foreigner), Thanis and Malos. 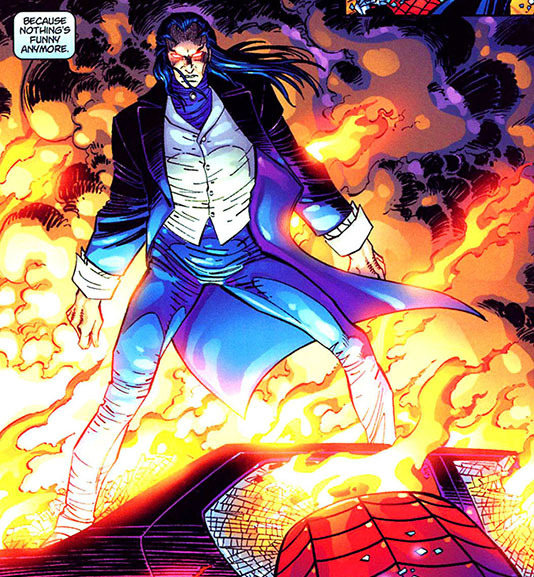 Morlun was revealed to have been mistaken for Wendigo and Grendl over the years. In this novel Black Cat also brought Dex in for interrogation on his activities with Morlun. Thanks to Per Degaton for the info. 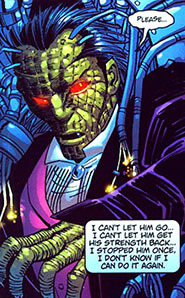 Dachs was revealed as a Morlun victim in Germany's entry in Marvel Atlas#1. Bundesadler was named in Morlun's entry in OHOTMU A-Z HC#7. By Henrique Ferreira courtesy of Spider-Fan. Reformatted by Prime Eternal, Updated by Markus Raymond. Clarifications: None comes to mind. We know almost nothing about Dex. We don't even know if Dex's his real name, a diminutive, or just a nickname. What we do know: Dex was recruited/enslaved by Morlun, probably several years ago, or at least months ago. Dex didn't have free will, he had to obey Morlun's every command (the simplest example, "Why haven't you eaten? ", "I'm not hungry", "Eat. ", "Ok."). He asked Morlun to kill him at least once, but Morlun refused. After the battle that opposed Spidey to Morlun, Morlun was very weak, and Spidey was left with the dillema of killing him or leave him alive to cause more deaths. Dex, who stole a gun from the corpse of a policeman that Morlun killed, presented his official resignation request, shooting Morlun in the chest. 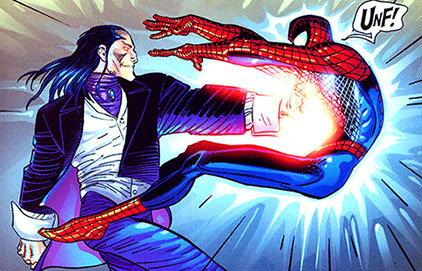 Morlun, weakened by the radiation and by the beating Spidey gave him, couldn't resist the wound and died. Spider-Man chased and caught Dex, but Dex said that Morlun hurt him a lot, and Spidey decided to let him go, if he never came back. Dex left singing "The witch is dead". (Spider-Man: The Darkest Hours) - Later the Black Cat brought Dex in for interrogation on his activities with Morlun.